Calliaqua at Sugar Hill is a great choice for families or a few couples who want to be pampered. The villa’s pool is massive, and there’s tons of space outside to lounge, tan, and relax. The house is in the Sugar Hill Resort Community, so you’ll have access to on-site fitness equipment, tennis, and nearby golf. Sugar Beach is only ten minutes away by car, and there’s several more beaches nearby. If you want water sports and great snorkeling, check out Colony Club Beach. For incredible surfing, head over to the rough water at Bathsheba. If you want a quiet swim, try Crane Beach, which is protected by a coral reef. Sandy Lane Beach has turtle watching spots at Folkestone Underwater Park, and snorkeling and water sports. If you want a really developed beach with tons of shops and dining, head over to Accra Beach. Back at the villa, the housekeeper, a night guard, a laundress, and a cook will cater to you and your guests like you’re royalty. My favorite thing to do at the villa is to sit up on the balcony while the sun goes down—it’s the best place on property to take in the ocean view! Calliaqua is a Gillespie and Steel designed vacation home in the Sugar Hill Resort Community. 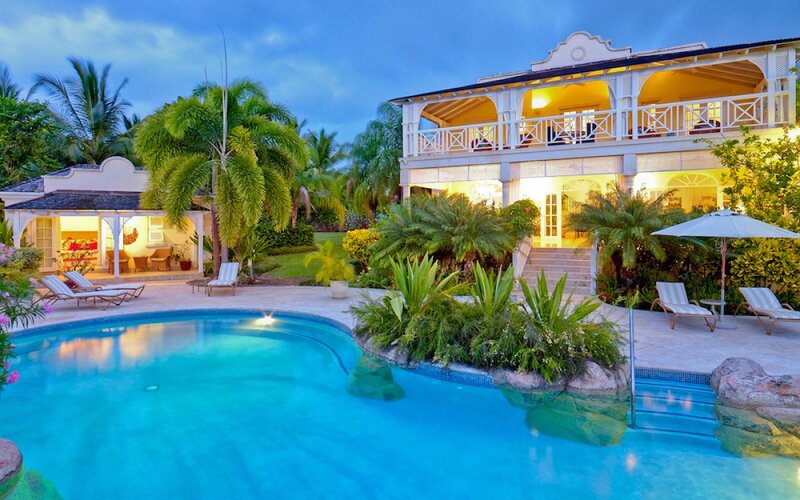 With views of the Caribbean Sea, an acre of manicured gardens, and a full staff, this villa is one of the most luxurious homes in the community. The covered terrace has al fresco dining tables and lounging furniture facing the sea. From the terrace, guests can head down to the massive pool and soak under the miniature waterfalls. Sun loungers and umbrellas are scattered all over, and the gazebo offers a bar with a fridge, informal dining arrangements, and comfortable chairs. The deck is bordered by gardens, so guests have total privacy as they unwind. Follow the French doors into the villa’s living room, which has high ceilings, marbled floors, and chic furniture. The spacious kitchen is fully equipped with high-end appliances, and the villa’s cook will take care of most meals. A housekeeper will clean the villa six days a week, so guests don’t have to lift a finger. There are five air-conditioned bedrooms in the villa: one on the main floor, three on the upper level, and one in the cottage. Each of the three upper level bedrooms have French doors that open directly onto the furnished balcony. One suite has a king-sized bed, one has two twin beds that can be made up as a king, and the third has a queen-sized bed. The fourth bedroom has a king-sized bed, ensuite bathroom, and access to the terrace. The cottage has a king suite, an ensuite bathroom, and its own patio that connects to the pool terrace. A perk for guests at Calliaqua is full access to Sugar Hill Resort’s facilities. The Tennis Village has floodlit courts, and the clubhouse has a 2000-square-foot communal pool, a restaurant, and an air-conditioned gym. Sugar Hill guests have membership at the Royal Pavilion Beach Club, and access to the exclusive members’ area at the Suga-Suga Beach, which is a 10 minute drive away. The members’ area offers water sports at discounted rates, including water skiing, hobie cat sailing, kayaking, boat trips, and swimming with turtles. Bedroom 5: Patio opens to view of the swimming pool.